Harry Potter is preparing to leave the Dursleys and Privet Drive for the last time. But the future that awaits him is full of danger, not only for him, but for anyone close to him - and Harry has already lost so much. Only by destroying Voldemort's remaining Horcruxes can Harry free himself and overcome the Dark Lord's forces of evil. 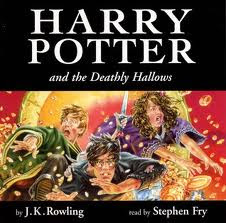 In this dramatic conclusion to "The Harry Potter Series", Harry must leave his most loyal friends behind, and in a final perilous journey find the strength and the will to face his terrifying destiny: a deadly confrontation that is his alone to fight. I can not believe I had not read the last book in the series. What was wrong with me?! This final installment was so filled with action I was practically on the edge of my seat. I mean, what was going to happen?! How would it all end? I don't want to give anything away. You know me. I loved all of it. I missed some characters immensely. I loved the epilogue. I want more. Why can't this series go on forever and ever. I could never tire of it. Honestly. I started off not enjoying Stephen Fry's narration, but I do believe he got better throughout the series. He really defined the character voices and he brought life to everything. If it has been awhile since you've visited Hogwarts why not go back? Try the audio books! You won't be disappointed. I feel like I just read it for the first time. You should do it!